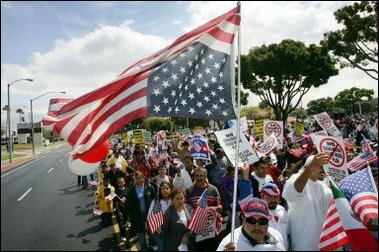 The Mexican Flag waving immigrant rallies across the United States are sparking backlash from Americans who are sick and tired of the current laws being ignored. The massive pro-immigrant marches and rallies sweeping across the country have fueled a growing countermovement and piqued interest in upcoming civilian border patrol missions, leaders in the anti-illegal immigration movement say. Within 48 hours of the 20,000-strong march in Phoenix, the Arizona-based Minuteman Civil Defense Corps signed up about 300 new volunteers for patrols along the U.S.-Mexican border, said Chris Simcox, the organization’s leader. Today, volunteers plan to kick off a monthlong border watch in Arizona, California, New Mexico and Texas and report undocumented immigrants to the U.S. Border Patrol. Two out of three Americans say to enforce the current laws before debating any new ones. 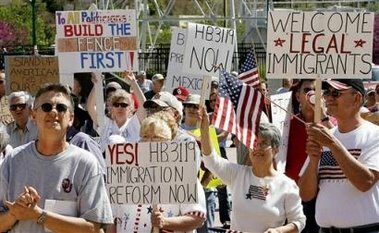 Susan Tully, national field director for the Washington, D.C.-based Federation for American Immigration Reform, which advocates reducing illegal immigration, said her office has been “overwhelmed” with phone calls from frustrated people looking for a way to get involved in a counterprotest. Tully said she has been alarmed by some of the calls and urged restraint and caution. “I can tell you the frustration you can hear in their voices and the outrage. It’s pretty scary,” she said. She also worried about how pro-immigrant demonstrators are interacting with members of FAIR and other anti-illegal immigration organizations. “I promise you if we announced tomorrow that we were going to have a march in Los Angeles or Phoenix, the other side would be out there to confront them, and it could get really ugly,” Tully said. Some of the protests are planned by illegal immigrants. 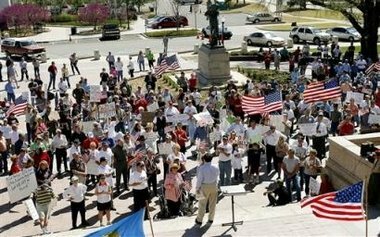 A Rasmussen Reports Poll released on Saturday found that two-thirds of Americans say first control our borders and enforce existing laws before debating new immigration laws.